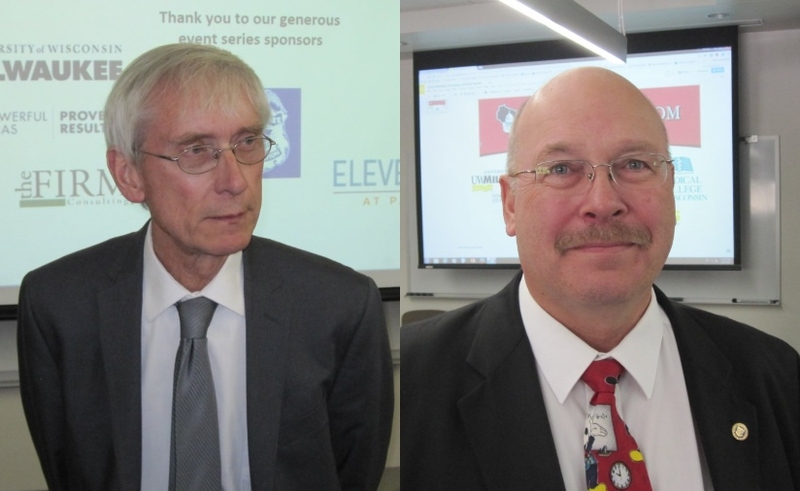 Evers and Holtz square off in superintendent's race; sparks fly both ways. Tony Evers and Lowell Holtz. Photos by Michael Horne. An event that was billed as an informational “candidate forum” for the non-partisan position took on a political edge Monday when the biggest story to come out of the event was whether challenger Lowell Holtz should be investigated for sending a political e-mail from a district account during school time, as was uncovered by One Wisconsin Now, a liberal advocacy group and reported by the media. Incumbent Superintendent Tony Evers, seeking his third term, said he would support such an investigation, adding that he had committed a similar error in 2009 and paid a small fine for “pushing the wrong button,” as he put it. 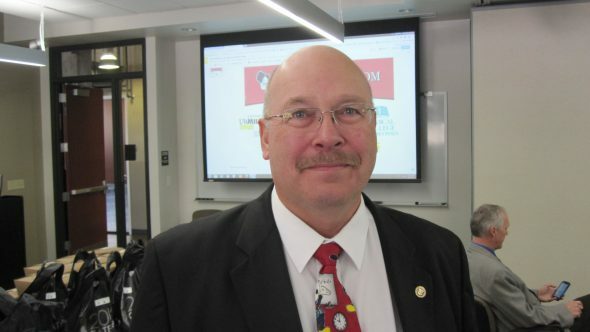 Holtz has also been accused of hatching a plan to offer a state-funded job to his formal rival John Humphries (and vice-versa) should one drop out, and the other win the April 4th general election. (Neither dropped out). These hot topics and charges are more reminiscent of a partisan campaign than a competition between two men with Ph.D. degrees in education. But much has changed in the educational environment since the enactment of Act 10 and growth of voucher and charter schools under Gov. Scott Walker. Beginning with statehood in 1848, Wisconsin’s superintendent was chosen in the November general election for a two year term on a partisan ticket, just like the other constitutional offices such as Governor, Attorney General or Secretary of State. This state of affairs, with its predictable political convulsions, lasted until 1902, when voters approved an amendment to the state constitution that the office be non-partisan, with a four year term — twice as long as the governor’s term at the time, further insulating the position from politics. The idea was that the superintendent should be above the fray, much like the state’s non-partisan Supreme Court Justices. Today, these are the only non-partisan officials elected on a statewide vote, and are chosen in Spring elections. But, like recent Supreme Court races which have been marked by sharp ideological divisions, the race for superintendent has becoming increasingly partisan. Evers has the support of traditionally Democratic groups such as unions and public school supporters, while Holtz, who calls himself the “Kidservative,” has the support of school choice groups traditionally allied with Republicans. Evers took 69 per cent of the vote in a low-turnout three-way primary with Holtz earning 23 percent and John Humphries 7 percent. 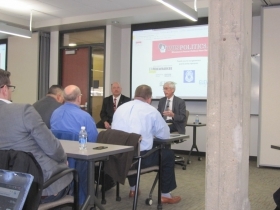 Evers and Holtz met in Milwaukee on Monday for what was billed as a candidate forum — not a debate — sponsored by WisPolitics.com as part of its Milwaukee luncheon series, which comes to town about six times a year to discuss issues and events of the day. The forum doesn’t have a regular home, says WisPolitics founder Jeff Mayers, but is thinking of settling down to a single venue. Right now the show was on the road at the UWM Joseph Zilber School of Public Health on the site of the former Pabst Brewery. 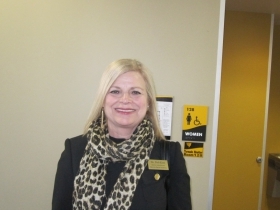 As attendees and participants began filing in for the noon luncheon, Mayers greeted them at the door, and saw that everybody put on a name tag, however exempting the guests of honor from this requirement. Lowell Holtz. Photo by Michael Horne. Holtz was the first to arrive. He is a bit over 6 feet tall, bald and of fairly large build, dressed in a conservative suit and a not-so-conservative Mickey Mouse tie. 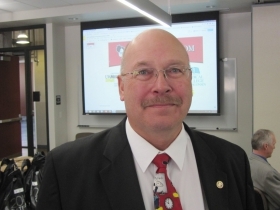 You could easily imagine that this one-time teacher had taken five years off from his profession when his kids were young to serve as a police officer in Whitewater, which he did before returning to academia and its principaldoms and superintendencies. 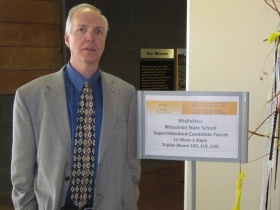 He recently retired from the Whitnall School District, from which his controversial e-mail was written. Holtz said that when he was first named a school principal, he made it a goal to never be in the office, but rather in the classroom, where “it’s more fun.” And, for a guy who looks more like a coach than a superintendent, it would be easy to see him in the stands, cheering on his teams. Tony Evers. Photo by Michael Horne. Evers followed Holtz by about 15 minutes. He, too, is tall, but in an angular way. He was dressed in a grey sports coat and grey tie over black trousers. His head is covered in white hair, with some of it swept forward. Both men speak in simple modulated tones that teachers develop as part of their professional experience. During the hour-long discussion, neither raised his voice or brought up any personal observations about his opponent. Nor were the e-mails or job offers discussed until the end of the program. 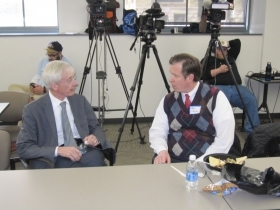 That’s when the television reporters encircled Holtz, asking his side of the story — he said he would abide by whatever official finding results — and getting Evers’s response, which was that an investigation of his opponent’s e-mails would be a welcome thing. 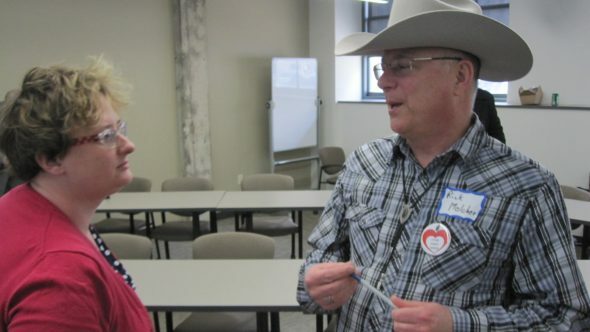 The discussion was moderated by Mayers, who is accustomed to this sort of thing, and clearly familiar with the complexities of the state’s governance, including the $12 billion public instruction budget. He spoke without notes, and allowed the candidates to alternate in being the first to respond to a query. Evers, the incumbent, got the first shot. He was asked what his plans were for the next four years. They were “relatively straightforward,” he said. Make sure we have the resources. Evers said he proposed a budget with $700 million in addional funding and the governor has adopted a good part of the budget, which will “absolutely” be adopted by legislature, he predicted. 1 in 5 students in state suffer from some mental health issues, and the budget will increase to assist these children. The shortage of teachers in rural areas must be solved. Change the dialog with the teaching profession. Wisconsin “can’t be last in graduation and achievement gaps” — with schools that are either incredibly successful or incredibly poor. “There are two ways of getting out of poverty: one is education — the other is crime.” Uneducated kids turn to crime. “Need to return safety to our schools.” Holtz on several occasions mentioned schools themselves as being unsafe, and referred to unsafe neighborhoods as a blighting influence on childhood education. Schools should give students an opportunity to compete for jobs. Support for Walker’s increased funding for rural school transport. 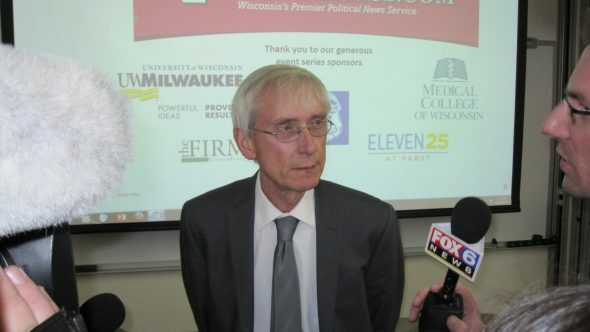 “There are people who say this is a Democratic or a Republican race.” Evers could work with a governor of either party, and noted that Walker called him before announcing his budget to say that Evers would be pleased with it, and he appears to be so. “Post-Act 10 I haven’t had to lay a single person off.” Previously, this was often required. Loves the concept of community schools. Percentage of take home pay is down some 2 per cent. Job training for parents in schools should be considered. 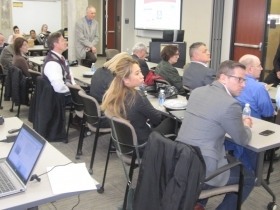 The attendees included Dr. Deb Kerr, the Brown Deer School System Administrator, Meg Jones of the Journal Sentinel and her former colleague, Alan Borsuk (a senior fellow at the Marquette University School of Law) who continues to write on educational issues. Rick Melcher. Photo by Michael Horne. Rick Melcher, a school teacher from Racine was in the audience of 50 wearing a cowboy hat, announcing that he is a write-in candidate for the position. Fox 6 political reporter Theo Keith was there, killing time with a cowboy-related pastime of his own: reading the recently released autobiography of Sheriff David Clarke. Keith found the book somewhat thin in its coverage of Clarke’s life from 1956, when he was born, to 2002, when he became sheriff. Kashoua Yang, the candidate for judge, made an appearance at the forum, while her challenger Scott Wales did not. These two have been everywhere the last couple of months, vying to replace retiring judge John Siefert. Cudahy alderman Justin Moralez, a former moderate Republican candidate for assembly attended the event, as did Van Mobley, a Concordia University professor who announced his support for Donald Trump in March, 2016. He had a pleasant, sit-down chat with Evers prior to the event.